The house is part of a residential complex, surrounded by a wonderful park, designed by a well-known Italian architect, Mangiarotti, who perfectly integrated the houses in the natural environment. For this design, the architect has received in 2009 the prize 'Architects Verona'. The house is well cared for furnishings: the living room has a fully functional fireplace, the kitchen has been recently renovated; one bedroom has a double bed, the other has two single beds. Plus the ability to use the fireplace, the house is equipped with heating so you can use it even in the winter months. Around the house is a green space with trees pertaining to the house itself, which allows a perfect privacy. The park and the environment are very suitable for a holiday for families and children and for longer stays. In the residential complex there are two swimming pools, one for adults and one for children. There is also a tennis court, freely usable by guests, such as the pools themselves, free of charge. In the swimming pools are available to residents and guests sunbeds, deckchairs and umbrellas .Sopra the small pool there is a ping-pong. The two pools are open from 'beginning of May to the end of September. It is also available, for guests of the house, a WIFI service with ADSL with UNLIMITED access. A parking lot is located near the house, but there are two more in different locations in the park. One of them is near the swimming pool, which, therefore, can also be reached by car. FOR RESERVATIONS OF PU 'OF TWO WEEKS a discount of 10 percent will be applied. FOR RESERVATIONS OF FOUR WEEKS a further discount will be applied. In this case the prices will be agreed with the owner. THE ANIMALS ARE WELCOME, provided they are well educated. Will they provide some toiletries and hairdryer. Although this property is not far from all conveniences, the house is located in a wooded, private enclave. It is carefully decorated with interesting art, and fully-equipped with everything needed for a perfect vacation. We stayed for a month, experiencing both cool and warm weather, and remained comfortable during rainy days. Even the birds seemed extra happy to be there. Reliable internet allowed us to stay in touch with our work and family in the U.S. The location makes a perfect home base for 2-4 people, with easy access to the autostrada for day trips to Verona, Mantova, Vicenza, Brescia, Modena and other delightful cities. Lake Garda can be reached by car in 15 minutes, or by foot within 1 1/2 hours. Nearby Monte Baldo offers hiking and biking trails that range from easy to difficult. Two excellent restaurants and the town of Costermano are within walking distance through vineyards. The train station in Peschiera is 20 minutes away offering regular service to Milan, Venice and points in between. Most memorable is Chiara, our gracious, responsive, host. She has a wonderful sense of humor and deep knowledge of the Veneto and neighboring regions. We will always keep this magic place in our hearts and look forward to returning. Many thanks for detailed description and for so many pieces of information, really important for future guests!! 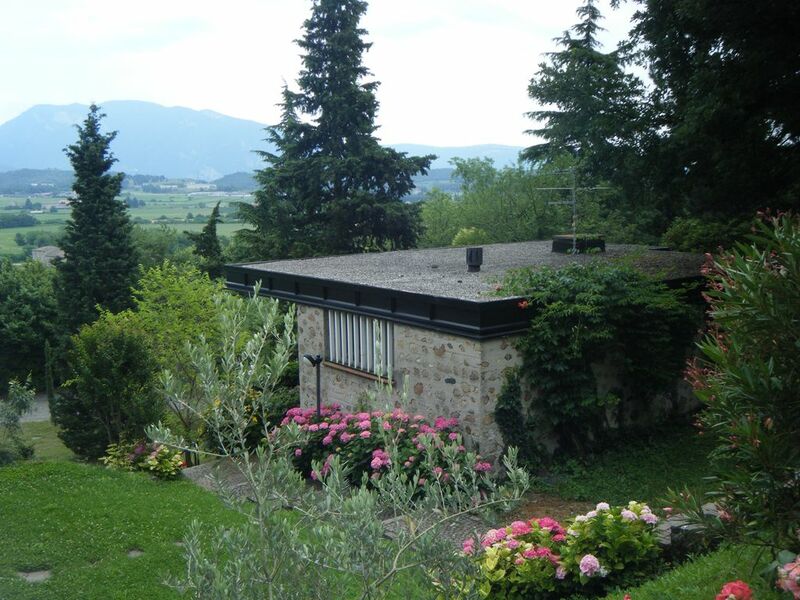 We highly recommend this lovely house near Lake Garda. The photos do not do it justice, because the prize-winning architect Mangiarotti designed the community so that the homes blend into the natural landscape. The house is spacious, immaculately clean, and superbly equipped. We have rented vacation properties for the last 15 years and have never had such a well-equipped house. Any pot or pan you need is there, and the new washing machine and dishwasher make vacation life easy. The high ceilings and large doors and windows create a flow of fresh air, and the house is well lit. The outdoor area is a wonderful place to eat and to relax. The pool is delightful. Beautiful walks among the vineyards are just steps away. The owners are responsive, intelligent, and cultured. We were welcomed with treats of fruit, olive oil, wine, and a professional-quality homemade cake. Chiara was extremely helpful in her suggestions and answered all e-mail questions very promptly. We communicated mostly in Italian, but Chiara has a decent command of English. Grazie!! thank you! We were moved by your kind words. We take pride in putting passion and professionality in what we do, and we’re happy if we can welcome our guests with warmth and offer a beautiful place where to spend their holidays. We’re glad that these efforts have been appreciated and we hope to have the opportunity to have you again here as guests. Pasamos tres semanas en la casa de Chiara y Adelaide. Fueron tres semanas super-agradables. La casa es muy bonita, con todo lo que uno necesita para estar a gusto; el parque estupendo para pasear y la piscina un encanto. Es un lugar perfecto para familias con niños en cuanto no hay peligros y muchas posibilidades de hacerse amigos. El lugar esta bien situado para visitar el norte de Italia. Estuvimos en Venecia, Vicenza, Milan y Parma, hicimos giras en el lago de Garda y en la montaña cercana (Monte baldo). Os recomiendo esta casa y las dueñas que la llevan que siempre estuvieron a nuestra disposicion. Grazie della bella recensione! La soddisfazione degli ospiti ci rende felici: quello che ci piace di questa attività è proprio l'accoglienza e l'opportunità di incontrare persone nuove. Abbiamo sempre cercato di far sentire gli ospiti a loro agio. Chiara e Adelaide. Nous avons passé un mois de vacances dans cette delicieuse maison immergée dans la nature du Parc de Murlongo, près du Lac de Garde. L'accueil a été des plus agréables, la maison est bien equipée et très propre, au calme dans la verdure. La piscine est à deux pas, de l'autre côté du parc. Nous nous sommes baignés et les enfants ont trouvé des amis pour jouer. Centre commercial , restaurants, tout est à proximité. De très belles vacances. Die Vermieterin Chiara hat uns sehr warmherzig und freundlich empfangen und uns alles ausführlich (auf englisch) erklärt. Sie hatte sogar einen Kuchen, Erdbeeren und Wein für uns bereit. Eine entzückende Dame. Die Unterkunft ist mit allem ausgestattet, was man benötigt. Es hat wirklich an nichts gefehlt. Das Häuschen ist nicht sehr groß, aber charmant eingerichtet mit einer hübschen, schattigen Terrasse. Die Parkanlage ist wirklich sehr schön und großzügig, man sitzt nicht zu eng aufeinander. Ein großer Supermarkt ist nur wenige Autominuten entfernt. Man kann die Unterkunft uneingeschränkt empfehlen. Thank you so much for the appreciation of our hospitality , of the house and the park. I hope to meet you again : your family will always be welcome here ! Nachdem wir sehr herzlich von unserer Gastgeberin Chiara und ihrem Mann empfangen wurden, könnten wir die wunderschöne Umgebung erkunden. Die Anlage ist sehr individuell, die Ausstattung der Wohnung ist sehr ansprechend und gemütlich. Die Lage der Hauses ist optimal für Wanderungen in Richtung Garda und Bardolino und Städteausflüge. Wir haben uns sehr wohl gefühlt. Thank you for the appreciation of our hospitality and of the location! I am very pleased that you stayed comfortably in my house in the winter season. The single house is situated in the tranquil atmosphere of a beautiful park, in a residential complex with pool and tennis court and with easy parking. The park is fenced and has a caretaker who lives in the residence (house 33) and can be available in case of need. Lake Garda is just a short distance away (4 km) and so is Mount Baldo (2218 m asl) where you can enjoy beautiful hiking and mountain biking. Nearby you can visit the beautiful art city of Verona which in summer offers theater performances in the Roman Theater and opera performances in the ancient Arena amphitheater. Mantua is also near, with the marvelous Palazzo Gonzaga. Milan and Venice are about an hour's drive away. Also interesting is the opportunity to visit the cellars of Valpolicella, which is 10/15 km., Where you can taste the typical wines of the area: Amarone, Valpolicella classico, Recioto etc .. In this regard, we inform you that the famous Vinitaly event (Salone and International Wine Fair) will be held this year 2018 from April 15th to April 18th. The area where the park and the house are located also has numerous theme parks (Gardaland, Zoosafari, Caneva), water parks and thermal parks, as well as golf courses. Restaurants, supermarkets, cafes, shops are a few minutes drive from the park but can also be reached on foot in about 10 minutes of walking along a road through the fields. Nel caso di affitto mensile o di più mesi, le condizioni possono variare ed il prezzo sarà concordato con la proprietaria.. Verranno richiesti euro 60 per la pulizia finale. Il check -in dovrà avvenire non più tardi delle 21.